The first of two sprint races this afternoon, Race Four will commence with cloudy conditions. It's a Brad Jones Racing front-row as Jason Bright and yesterday's winner Fabian Coulthard fill positions one and two for the 120km race. Close behind on the grid are Jamie Whincup, Garth Tander, Craig Lowndes and Scott McLaughlin. Cars now completing warm-up lap. L1 Bright first into the first corner, looks clean as the rest come through. L2 Tander now into second - after one lap it's Bright, Tander, Coulthard, Whincup McLaughlin. L2 Huge hit for Reynolds three abreast at the hairpin and on the guard rail. Huge damamge to Bottle-O Falcon. Reynolds getting out. Safety Car. L5 Reynolds' car taken back to pitlane, racing should resume shortly. L6 Lights out on Safety Car and cars are away. L8 Bright, Tander, Coulthard, Whincup, Davison, McLaughlin, Lowndes, Courtney, Winterbottom, Fiore. Reynolds says he hit two walls in the incident. L11 Winterbottom the fastest lap with a 52.2770 (L10). Frosty in eighth. L12 Van Gisbergen looking vulnerable after Webb goes through and D'Alberto gets up alongside. Fighting over p12. L15 and fast first sector for Bright at the front. L15 Investigation, cars 17 - Blanchard - and 9 - Engel - at Turn 7 on Lap 6. L17 Norton Nissans racing close, back in p19 and 20. L18 Bright, Tander, Coulthard, Whincup, Will Davison top five. L19 Lowndes says he's running out of rear tyres. L21 and we've reached half race distance. Two cars already out of this race in Reynolds and Wall. L22 Bright runs fastest (L21) with a 52.1595. Wall says he was run wide and into Reynolds earlier in the race. L23 Courtney has second and third fastest laps of race after Bright. Courtney p8. L27 Bright another quickest lap (L26) 52,0716. Pre-race he thought pace would be quick out of traffic. L32 and the top 10 remain the same: Bright, Tander, Coulthard, Whincup, Davison, McLaughlin, Winterbottom, Courtney, Lowndes and Fiore. L37 and not much change to the order. L38 with four laps to go, Bright has over 3 secs on second-placed Tander. L39 Great driving from McLaughlin as Will Davison tries to challenge for sixth. L41 Fiore into ninth as he passes Lowndes. FINAL LAP and Winterbottom and Courtney are through on McLaughlin. McLaughlin now eighth. BJR two from two this weekend - Bright crosses the line ahead of Tander, Coulthard, Whincup, Will Davison, Winterbottom, Courtney, McLaughlin, Fiore, Lowndes. 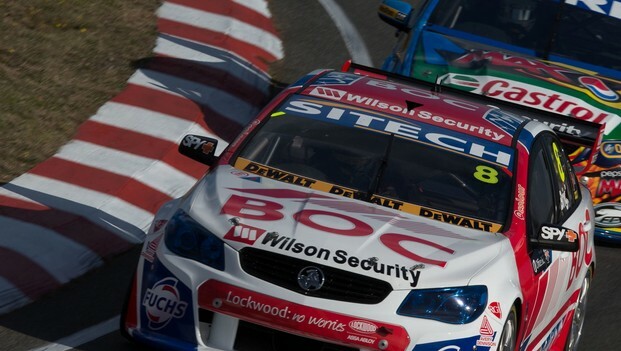 TEKNO cars fill the next two spots, Webb and Van Gisbergen. Bright says hopefully this year he won't have to wait as long between wins. Tander says it wasa good race with Fabs and happy to be second. Coulthard says pretty good weekend with the win yesterday and podium today and congratulates his teammate.